Kids love animals and books about them. 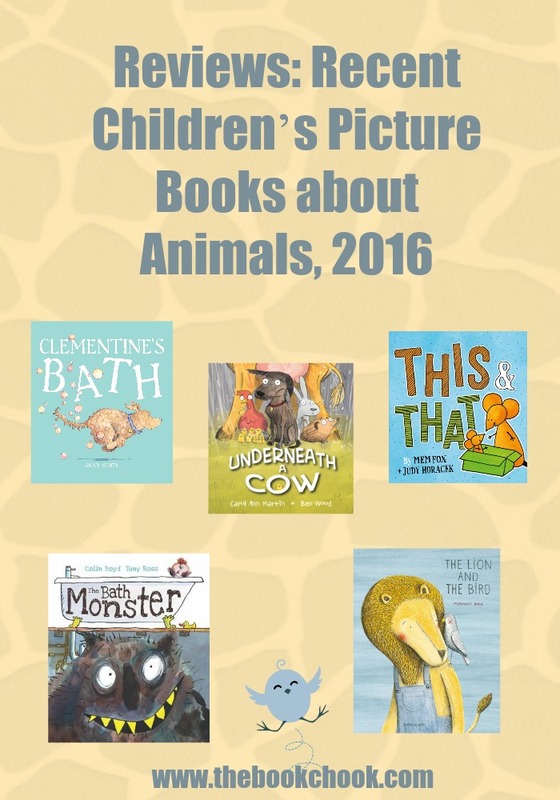 Here are some new picture books about animals that may well delight a child near you! What a charming gift this would make for a baby and its young parents! Fox’s picture books are always special. This one has a rhythm perfect for gentle bouncing on a lap, but slows down and ends with love and a kiss goodnight. Horacek gifts us with cartoon-style illustrations against a simple background, but then we come to a colourful and more detailed market and two giraffes in a tangle, and later a hospitable king welcoming an array of characters to his castle. The whole is just a little piece of perfection and one I think is destined to become a classic. And for all the animals sheltering underneath Madge the cow, there's no better place to be when you are caught in a Great Big, Terrible, Awful Storm! I really enjoyed Underneath a Cow. There’s lots of fun within its pages for adults as well as kids, including a wonderful Underneath a Cow song that chases the storm away. Children will love the cover and immediately try to guess what will end up under the cow. Wood’s quirky cartoon-style animals are very cute. My favourites were the chickens, especially the little black one. Clementine’s Bath This children’s picture book was written and illustrated by Annie White and published by New Frontier (2015). Clementine runs away to escape a bath. NOT A BATH! thinks Clementine. She hides under the bed, behind the curtains and even in Baby’s toybox. Can her family find her in time to give her a bath? I suspect most kids will know a dog that likes to sniff things. They may also know one that likes to roll in something disgusting. Clementine is not fond of baths and runs off as soon as she suspects that’s what will follow her encounter with some garbage. Unfortunately for the stinky dog, her smell gives each hiding place away until she somersaults and lands SPLASH into the bath. White’s rhyming story rollicks along, accompanied by endearing and humorous illustrations. The Lion and the Bird This children’s picture book was written and illustrated by Marianne Dubuc, translated into English by Sarah Ardizzone and published by Book Island (2015). Here’s a cosy, friendly story about a lion who finds a bird with a broken wing and takes care of him. Even when winter brings snow, Lion makes sure Bird is warm and safe as they go tobogganing and ice-fishing, and later toasting their toes on front of the fire. Being together makes everything doubly enjoyable. Then Spring arrives, bringing the return of Bird’s old friends. Is there still a place for Lion in Bird’s life now? Dubuc’s illustrations are striking yet gentle, and perfect for this story about changing seasons, compassion, and the enduring nature of true friendship.